The riveted steel and aerodynamic forms of 1930s industrial streamline design: Inspiration of the Multifort. 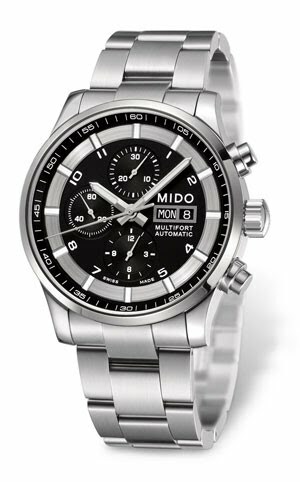 Mido has enriched the Multifort range with a new model. A black dial, embellished with delicately fine-brushed small plates, endows this chronograph with an understated and elegant style. The white Super Luminova® treatment creates an impressively luminous effect. The indexes marking each hour add a resolutely contemporary touch to this model. Sturdy, reliable and aesthetically pleasing, it has all the typical features of the Multifort line. This new model is an extension of the Multifort range and was inspired by the streamline style. This American design movement which emerged at the start of the thirties was a major turning point in the creation of products. In 1934, led by Georges Schaeren, the engineers and technicians at Mido developed the Multifort. Dependable, robust and resistant with real allure, these qualities made it a reference for reliability and high standards as soon as it was launched on the market. The new Multifort, and more particularly its chronograph model featuring an ETA Valjoux 7750 movement with many refined details and subtle features, clearly confirms the watchmaker’s liking for that age. With a diameter of 44 mm, a thickness of 14.50 mm and water-resistance up to 10 bar (100 m), the new Multifort stands out as an important model with distinctive aesthetic features. The scratch-resistant sapphire crystal reveals a black dial embellished with delicately fine-brushed small plates. The indexes, which mark the hours, add a resolutely contemporary touch to this timepiece. The white Super Luminova treatment creates an impressively luminous effect and makes the time particularly easy to read, even when night has fallen. The stainless steel bracelet gives this chronograph an elegant and sporty touch. Lovers of luxury watchmaking will also enjoy the opportunity to admire the magic of a self-winding movement manufactured to the highest standards through the crystal fitted on the case back. They will also surely appreciate the oscillating weight with its Geneva stripes decoration, the blued screws and finely circular-grained bridges. Mechanical chronograph movement with automatic winding. Mido calibre 1320 (based on ETA Valjoux 7750), 13¼’’’ Æ30.00 mm, height 7.90 mm, 25 jewels, 28,800 A/H, INCABLOC and NIVACOURBE shock-absorber, gilt GLUCYDUR balance, ANACHRON balance-spring, NIVAFLEX NM mainspring. Top and finely decorated movement with blued screws, circular-grained bars, oscillating weight with Geneva stripes and engraved Mido logo. Power reserve 48 hours. Tested and adjusted on 5 different positions for a high accuracy. Day and date at 3 o’clock. Stainless steel 316L (DINX2CrNiMO 17 12 2), 3 parts, scratch-resistant sapphire crystal, screwed crown and case back, transparent case back to see the fine decorated and top movement, 11-digit engraved serial number, water-resistant up to 10 bar (100 m). Stainless steel 316L (DINX2CrNiMO 17 12 2) with stainless steel folding clasp. Black, indexes with white Super-Luminova®. Hour and minute hands with white luminescent material (Super-Luminova®) for easy reading under water and at night.